33 SPECIAL EVENTS River Days Parade Sponsored by Brotherton Cadillac July 28: 10:00am S. 3rd Street, DT Renton. Download application at rentonriverdays.org or call 425-572-5702. Wenatchee Youth Circus Co-Sponsored by Walmart Shows at Cedar River Park. Tickets: $3.00 children under 18, $4.00 for adults. July 27: 1:30pm & 6:00pm July 28: 1:30pm Rubber Ducky Derby Sponsored by Renton Rotary July 29: 4:30pm. Ducks float the Cedar River from the Houser Street Bridge to Wells Ave S. A $5.00 ticket provides a chance to win prizes. SPORTS AND GAMES Six-A-Side Soccer Tournament Organized by Greater Renton-Tukwila Youth Soccer Assoc. July 28: fields at Renton High School for boys and girls U/9 thru U/16. grtysa.org. Tennis Tournaments For all three Tennis Tournaments, pre-registration required. Tournaments organized by the Renton School District. Register at www.USTA.com Junior Advanced Tennis Tournament June 29–July 1: Ages 10-18 Liberty Park, Lindbergh High School, Hazen High School and Renton High School Junior Intermediate Tennis Tournament July 13–15: Ages 10-18 Liberty Park, Lindbergh High School, Hazen High School and Renton High School Open & NTRP Tennis Championships July 20–22: All Ages Liberty Park, Lindbergh High School, Hazen High School and Renton High School ARTS AND CRAFTS Renton Annual Art Show Juried fine art for sale at the Renton Community Center. 425-254-9934. July 26 Preview Party ($20/pp): 8:00pm July 27–28: 10:00am–6:00pm July 29: 12:00pm–5:00pm The Art Market Art and hand-crafted items for sale. New "Marketplace" section to feature independent/franchise distributors. Email rentonriverdaysartmarket@gmail.com. July 27–28: 11:00am–8:00pm July 29: 11:00am–6:00pm 22 nd Annual Chalk Art Contest Sponsored by Wiener & Lambka, P.S. Organized by Allied Arts of Renton July 28: 12:00pm–3:30pm tennis courts at Liberty Park, free and all materials provided. 206-919-9746. 20 th Quilt Exhibition Sponsored by Bath Fitter Organized by Cedar River Quilters Quilted art pieces on display at the Renton Community Center. Vote for People's Choice. 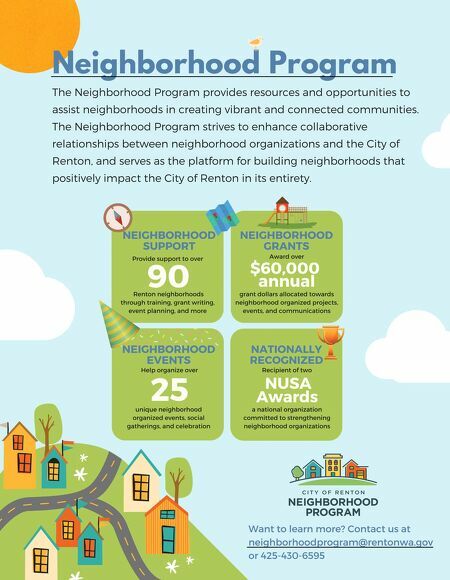 July 28: 10:00am–6:00pm July 29: 12:00pm–5:00pm STAGE ENTERTAINMENT Toyota Scion of Renton Stage (Main Stage) July 27–29: Visit rentonriverdays.org for line-up of artists and performance times. FUN FOR KIDS AT LIBERTY PARK Board Games of the World (Stoneway Concrete) Caricaturist Chalk Art Contest (Wiener & Lambka, P.S. & Allied Arts of Renton) Climbing Wall (The Law Offices of Steven D. Weier & Walker's Renton Subaru) Dizzy's Tumble Bus (UW Medicine-VMC) Hamster Balls Inflatable Playland Junk Chimes (Fred Meyer) Kids' Photo ID Cards LEGO PlayZone Petting Zoo Putt Putt Golf (Smith Brothers Farms) Sound of Culture (Renton Tech. College) Strolling Stilt Dancer Toymaker's Workshop (AlaskaUSA Federal Credit Union) ALL ABOUT FOOD Senior Day BBQ Picnic Sponsored by Law Offices of Dan Kellogg July 26: 11:00am–1:00pm, at the Renton Community Center. Advance tickets req'd. 425-430-6633. Pancake Breakfast Sponsored by Harley Exteriors Organized by Renton Lions Club July 28: 7:30-10:00am at the Renton Senior Activity Center. 425-381-7069 or chris5255@gmail.com Nibble of Renton July 27–29: 10+ food vendors, food trucks, come hungry to Liberty Park! EXHIBITS & DISPLAYS Renton History Museum July 24–29: Free admission this week ! Tuesday–Saturday, 10:00am–4:00pm Sunday, 12:00pm–4:00pm Community Information Booths Non-profits, public services, and festival sponsors. July 27–28: 11:00am–8:00pm July 29: 11:00am–6:00pm Health Screening Unit FREE screenings for Blood Pressure, Glaucoma, Diabetes, Sight, and Hearing. Mobile unit staffed by health professionals, Lions Club members, and volunteers. Children under 18 must have parent or guardian present; written permission for the tests will be required. Also accepting used eyeglasses and hearing aids. Sponsored by area Lions Clubs. July 27-28: 11:00am-8:00pm July 29: 11:00am-6:00pm Antique Classic Boat Show View 30+ antique and classic boats. Free boat rides! July 28: 10:00am–5:00pm at Gene Coulon Memorial Beach Park. acbs-pnw.org Puget Sound Chapter BMWCCA Car Show: 50th Anniversary of the 2002 July 29: 11:00am–3:00pm at Cedar River Park. BMWpugetsound.com. 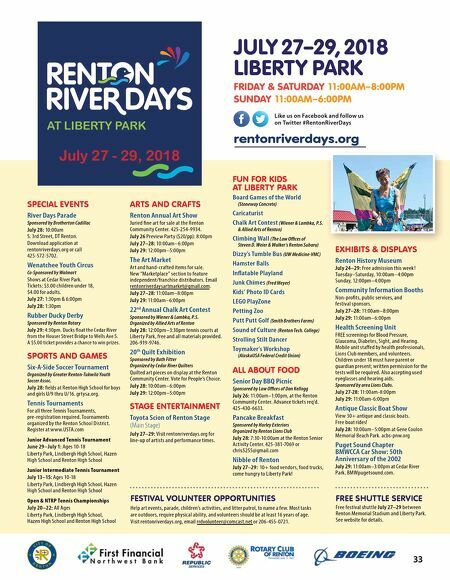 rentonriverdays.org JULY 27–29, 2018 LIBERTY PARK FRIDAY & SATURDAY 11:00AM–8:00PM SUNDAY 11:00AM–6:00PM Like us on Facebook and follow us on Twitter #RentonRiverDays FESTIVAL VOLUNTEER OPPORTUNITIES Help art events, parade, children's activities, and litter patrol, to name a few. Most tasks are outdoors, require physical ability, and volunteers should be at least 16 years of age. Visit rentonriverdays.org, email rrdvolunteer@comcast.net or 206-455-0721. FREE SHUTTLE SERVICE Free festival shuttle July 27–29 between Renton Memorial Stadium and Liberty Park. See website for details.